Watercolor seems to be easiest (and prettiest) way to watercolor images these days, at least this is how I feel. I am also enjoying messy watercoloring where I don’t have to stay withing the lines and be afraid to mess up the project. 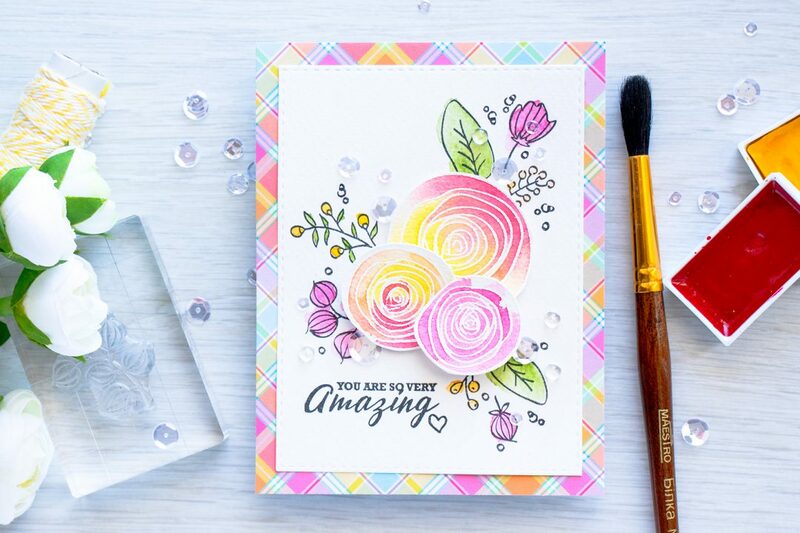 I’m sharing a floral watercolor card featuring a gorgeous Sketch Ranunculus stamp set designed by incredible Yoonsun Hur. 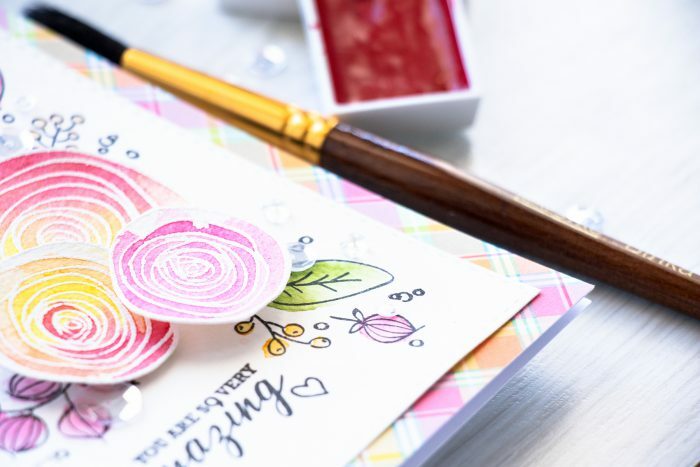 I started by heat embossing ranunculus in white embossing powder onto Arches Cold Press Watercolor paper. 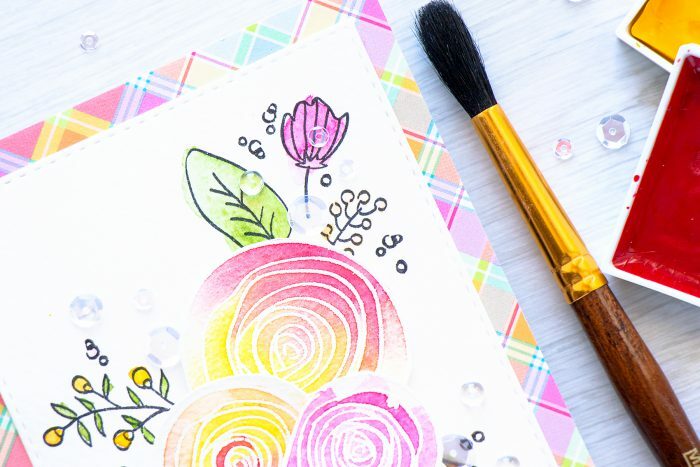 I quickly colored them using my Gansai Tambi watercolors and cut the the flowers out with my scissors. Because of the design of these I was able to easily create a new flower-size by simply trimming the outer layers of the flower colored in pink. I also stamped several images onto a watercolor panel using Simon’s intense black ink and again messy watercolored them. I was using my MISTI stamping tool and was able to double stamp the images to have a more darker black outline. I also double stamped the sentiment. Watercolored and heat embossed flowers were shaped a bit and adhered in the center of my panel, I used glue and foam adhesive. 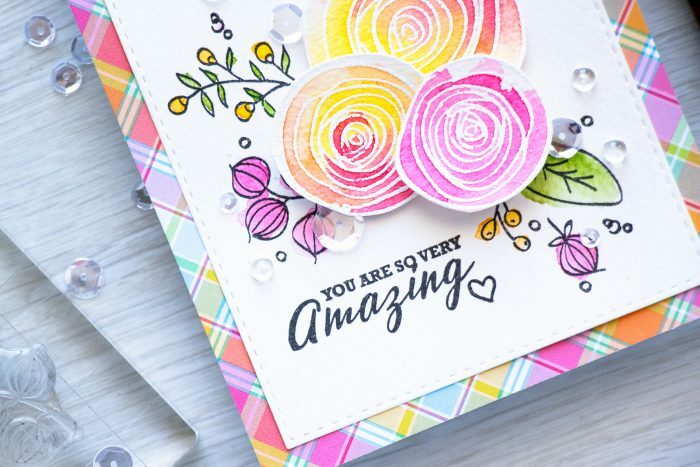 I also stamped a number of smaller circles around the images to complete the background stamping and also added lots of clear sequins from Pretty Pink Posh and several clear droplets. I love watercolor for the same reason. No need to be precise and the result is often beautiful. Your card is stunning! 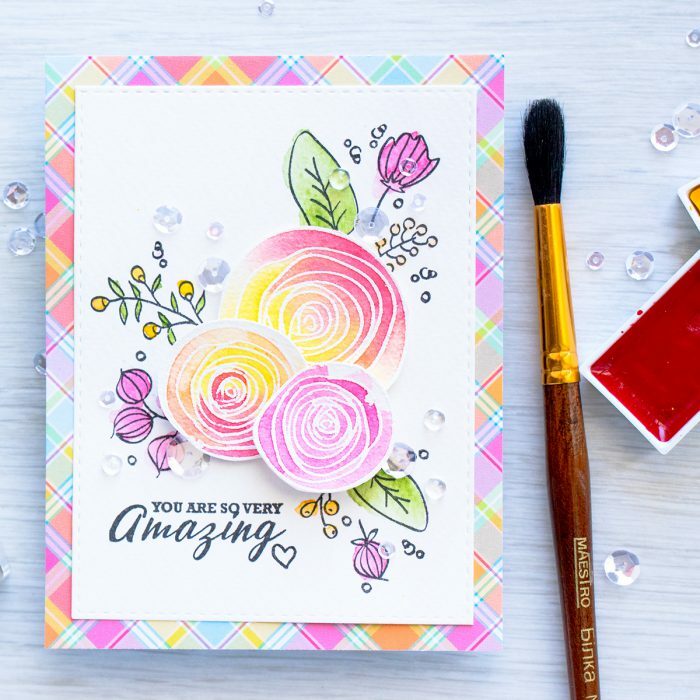 Love how you made this floral cluster. It’s perfect! And I like the plaid background too. This is just beautiful – I love it! Thanks so much!!! Truly one of the most BEAUTIFUL cards that I have ever seen! Thank you for sharing it with us!